T-Mobile today confirmed that the 4G HSPA+ version of their T-Mobile Sidekick and Samsung Galaxy S phones will be coming soon to its arsenal of phones. T-Mobile USA CEO Philipp Humm said, “We will launch the Samsung Galaxy S 4G and soon we will also launch a Sidekick 4G. Everybody knows the Sidekick, and we’re going to relaunch the Sidekick and bring it as a 4G device, Android based, into the market”. 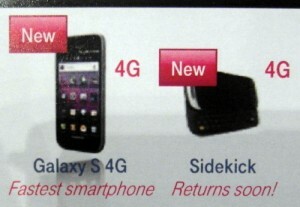 The new phones will be placed side-by-side with the Dell Streak 7 and the T-Mobile G-Slate Android Honeycomb tablet. Samsung will be announcing the next generation Galaxy S phone at the Mobile World Congress trade show on February 13. T-Mobile Sidekick was made by Danger which was acquired by Microsoft. Danger then went ahead to produce the Microsoft Kin which was a failed device. Next Why the Delay in Gingerbread Updates for Android Phones?